The team, consisting of over 100 astronomers from around the world, started a hunt for the cosmic monsters in 2011. Although the high-energy X-ray radiation that reveals their location is absorbed by the Earth’s atmosphere, it can be detected by X-ray observatories in space. Thus, they combined an ESA XMM-Newton survey — the largest time allocation ever granted for this orbiting telescope — with observations from ESO and other observatories. The result is a huge and growing collection of data across the electromagnetic spectrum , collectively called the XXL survey. 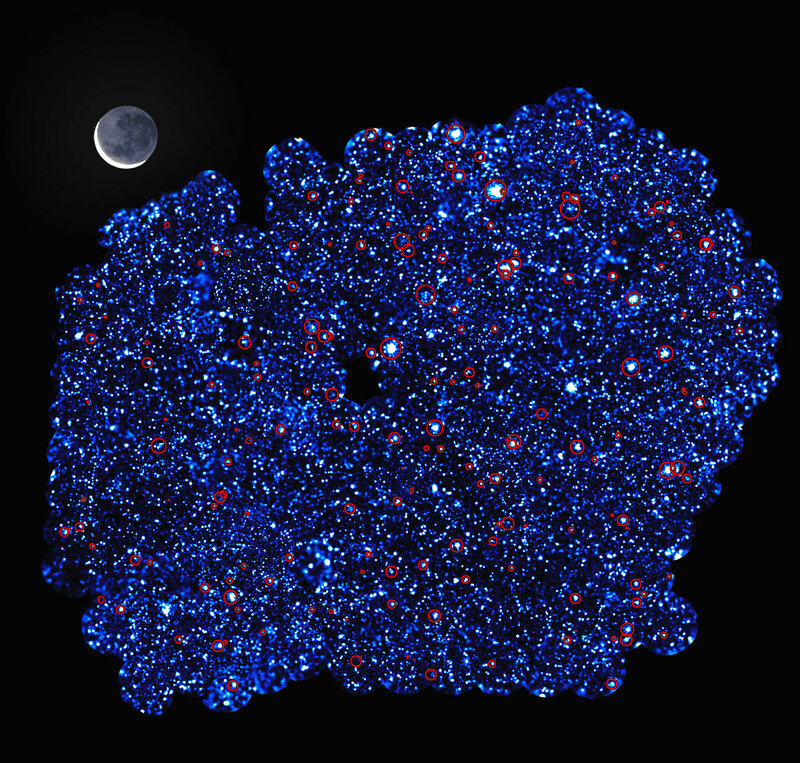 The XMM-Newton telescope imaged two patches of sky — each one hundred times the area of the full Moon — in an attempt to discover a huge number of previously unknown galaxy clusters. 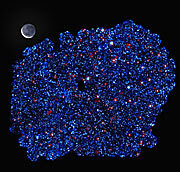 The XXL survey team have now released their findings in a series of papers using the 100 brightest clusters discovered . 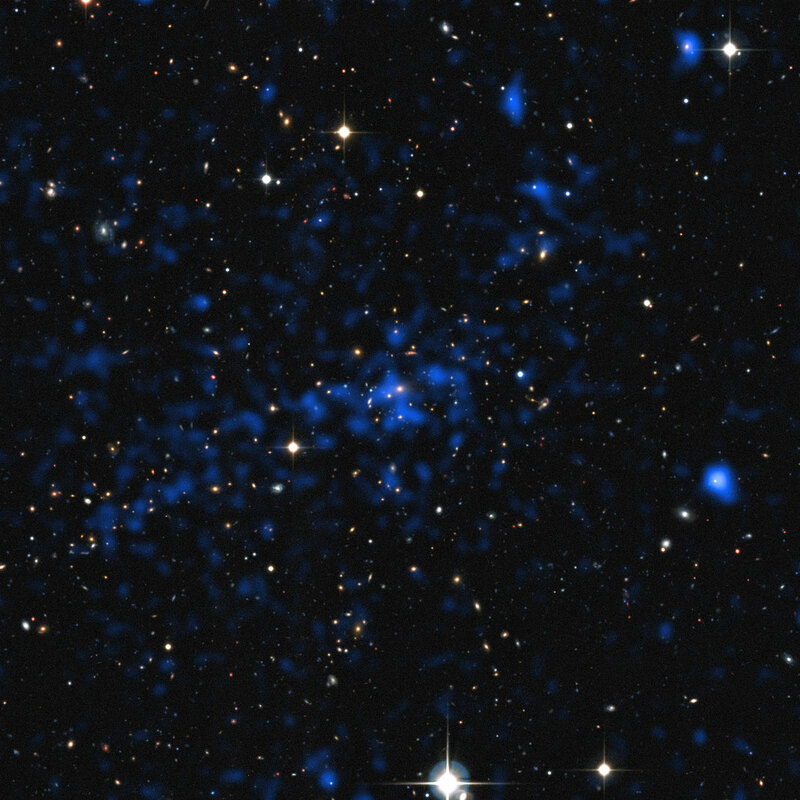 Observations from the EFOSC2 instrument installed on the New Technology Telescope (NTT), along with the FORS instrument attached to ESO’s Very Large Telescope (VLT), also were used to carefully analyse the light coming from galaxies within these galaxy clusters. Crucially, this allowed the team to measure the precise distances to the galaxy clusters, providing the three-dimensional view of the cosmos required to perform precise measurements of dark matter and dark energy . 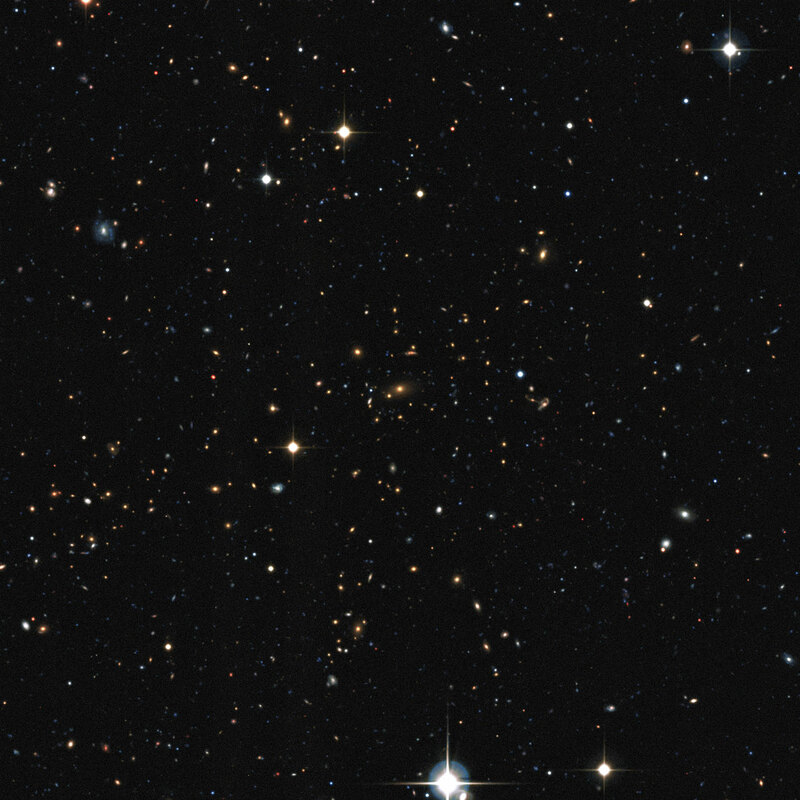 Another reports followup observations of one particular galaxy cluster (informally known as XLSSC-116), located over six billion light-years away . In this cluster unusually bright diffuse light was observed using MUSE on the VLT. The XXL survey has combined archival data as well as new observations of galaxy clusters covering the wavelength range from 1 × 10—4 μm (X-ray, observed with XMM) to more than 1 metre (observed with the Giant Metrewave Radio Telescope [GMRT]). 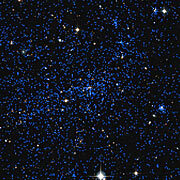 The galaxy clusters reported in the thirteen papers are found at redshifts between z = 0.05 and z = 1.05, which correspond to when the Universe was approximately 13 and 5.7 billion years old, respectively. 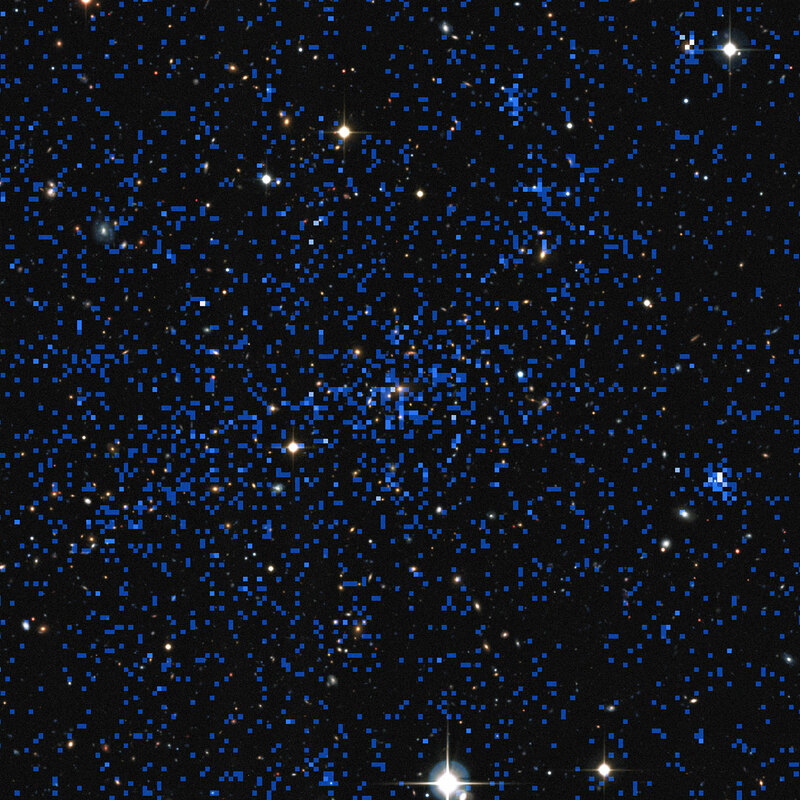 Probing the galaxy clusters required their precise distances to be known. While approximate distances — photometric redshifts — can be measured by analysing their colours at different wavelengths, more accurate spectroscopic redshifts are needed. Spectroscopic redshifts were also sourced from archival data, as part of the VIMOS Public Extragalactic Redshift Survey (VIPERS), the VIMOS-VLT Deep Survey (VVDS) and the GAMA survey. 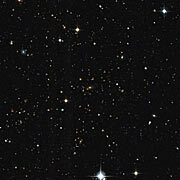 This galaxy cluster was found to be at a redshift of z = 0.543. A description of the survey, and some of the early science results, will be presented in a series of papers to appear in the journal Astronomy & Astrophysics on 15 December 2015. A full listing of the XXL team can be found here. XXL is an international project based around an XMM Very Large Programme surveying two 25 square degrees extragalactic fields at a depth of ~5 × 10–15 erg cm—2 s—1 in the [0.5—2] keV band for point-like sources. The XXL website is found here. Multi-band information and spectroscopic follow-up of the X-ray sources are obtained through a number of survey programmes is summarised here.